What are the most popular online bachelor's degrees offered in Utah? Utah is one of 16 member states of the Western Interstate Commission for Higher Education (WICHE), which offers a variety of benefits for resident students who want to pursue online learning. For example, thousands of Utah residents have saved millions of dollars while pursuing an online or traditional degree through WICHE's student exchange program. In addition to financial benefits, its State Authorization Reciprocity Agreement makes online courses accessible to students regardless of their geographical boundaries. When it comes to online learning, Utah administrators and officials strive to stay ahead of the curve, and the state legislature funded the Statewide Online Education Program (SOEP) in 2011. The SOEP's purpose is to provide access to high-quality digital courses regardless of where students currently attend high school. Students who enroll in these courses have a significant advantage if they go on to pursue a program through an online college in Utah. Online classes offer a host of benefits to nontraditional students, who can pursue a degree at their own pace while working full-time, raising a family, and fulfilling other responsibilities. Online courses are also more accessible for those with disabilities, as well as those in the military who must relocate every few years. Ultimately, students who enroll in an accredited online college in Utah get the same high-quality education and marketable credentials as those who take the traditional route. Numerous online program offerings in combination with affordable tuition rates makes Western Governors University one of the best online colleges in Utah for in and out-of-state students to invest in. While the school is headquartered in Salt Lake City, all course instruction is delivered completely online via the school’s distance learning platform. Within each subject area of the 20 bachelor’s degree options WGU offers, students will be assigned a personal mentor whose goal is to help individuals succeed from the time they start classes through graduation. Unlike other Utah online colleges, Western Governors University does not require students to submit entrance exams such as the SAT, ACT, GRE, or GMAT. The online college -- which has been around for fifteen years -- also differentiates itself from other schools through their tuition and fee schedule. Instead of charging per-credit, Western Governors University bills students a flat-rate every six months, incentivising students to quickly complete their degrees. The University of Utah is one of several in the state to offer degree programs in addition to individual web-based courses to their online student population. The school provides those who are enrolled with access to hundreds of online classes required to obtain a bachelor’s degree. Unlike other Utah online colleges, the University of Utah offers one online minor track: an undergraduate minor in gerontology. All courses in these programs and otherwise are created and instructed by on-campus faculty, and follow the same 16-week semester schedule as those taught in the classroom in Salt Lake City. As students complete their classes online, faculty members at the University of Utah are positioned to serve as knowledgeable, accessible mentors. To further support online students, the school offers multiple student resources that range from remote library access, web-based tutoring, and academic advising. The seven bachelor’s degree programs offered online through Utah State University can be a financially strategic investment for in-state students looking at online colleges in Utah. The different online undergraduate degree programs are cheaper for residents to complete. Tuition is less than $300 per credit hour, and online students can further offset the cost of college through the school’s extensive financial aid options. Utah State University, which started offering online courses in 1997, has developed their web-based learning program to include a robust selection of student services that expands beyond their campus in Logan. Remote learners can have access to online tutoring, remote library access, technology help, academic advising, and financial aid counseling. The school also gives online students the option to get involved in the Center for Women and Gender, and provides them with discounts on software -- two unique features that distinguish this online university from other Utah online colleges. Southern Utah University promotes experiential education and professional excellence. The 130-acre campus has attracted students to Cedar City since the institution was founded in 1897. The online school at SUU , which is one of the best online colleges in Utah, provides access to programs for students nationwide. SUU's 14 online undergraduate, certificate, and graduate programs are delivered in a flexible, asynchronous format, but learners who want to take some on-campus classes can choose to take hybrid courses. A major benefit of SUU, when compared to other online schools in Utah, is that all online students pay the same in-state tuition rates regardless of residency status. Transfer students with a minimum GPA of 2.0 are welcome to apply, and transfer credits may be granted. SUU also provides online students access to virtual tutoring sessions and a career center. Independence University, an accredited online college located in Salt Lake City, features many online degree program options that students can select from in the following academic areas: graphic arts, technology, business, and healthcare. IU supports their distance students by assigning each student an associate dean who works with individuals one on one to ensure they can complete their degree program successfully and on time. Free career development is available not only to current students, but also to all graduates of the university. To assist students in their career endeavors post-college, the school utilizes their connections with local and national employers and alumni to help online students network in job fields relevant to their studies. Independence University’s student resources are among the best of all Utah online colleges; the school provides all equipment (such as a laptop), supplies, and textbooks necessary for distance learners to complete their coursework at no extra cost. If you want to qualify for a range of high-paying job opportunities, earning a college degree is key. When deciding where and what you want to study, you may end up weighing both in-state and out-of-state schools. If you are from Utah, there are many advantages to attending college in your home state. Sticking close to home can qualify you for in-state tuition and help you build a network of regional professional contacts. You may also benefit from your school's name recognition on the local job market, and you'll be relatively close by if you need to occasionally visit campus. When researching programs, be sure to consider our list of the most affordable online colleges in Utah. All of the schools in this list are accredited, and our rankings highlight the colleges that offer the best blend of affordable tuition and return on investment. The University of Utah’s UOnline department offers distance learning across the nation through 12 online graduate and undergraduate programs. Majors include economics, nursing, and psychology. One online minor is available in gerontology. Distance programs primarily utilize asynchronous coursework and use of the Canvas platform. The Salt Lake City-based school is also one of the most affordable online colleges in Utah. Out-of-state students pay a higher tuition rate than Utah residents. The university is transfer-friendly, accepting most transfer credits from regionally accredited institutions. The university also has transfer agreements with most Utah colleges. Utah State University’s online department extends the school’s influence nationwide, offering 16 online bachelor’s and master’s programs, which include horticulture and communicative disorders. USU delivers most online coursework asynchronously. USU responds to online applications within 24 hours. The school’s Quick Admit program allows students to begin online coursework and earn up to 12 credits toward a master’s degree without formally earning acceptance. USU is also one of the most affordable online colleges in Utah, as out-of-state students pay just slightly more per credit than their in-state counterparts. The university is located in Logan. Western Governors University is known for its many online offerings. The Salt Lake City-based school does not provide any on-campus programs. The school has a curriculum for more than 60 online programs, which focus primarily on business, teaching, information technology, and health professions. Programs are completely self-paced. Students earn competency units (CU) instead of credits, and all coursework is asynchronous. Since WGU charges a flat, per-term tuition rate, the school is one of the most affordable online colleges in Utah. Learners can progress through programs at their own pace. Transfer students may earn CU's by submitting their transcripts. Southern Utah University, located in Cedar City, offers online programs that primarily focus on graduate and experiential learning, although the school does offer four online bachelor’s degrees. Undergraduate programs include accounting, management, and general studies. Most coursework is delivered asynchronously through the Canvas platform. SUU is one of the most affordable online colleges in Utah, allowing out-of-state online students to pay resident tuition. Scholarships and tuition waivers that are unique to the university also help increase SUU’s affordability. The only requirement for admission to SUU’s graduate online school is the submission of standardized tests, preferably the GRE, GMAT, or MAT. Weber State University, located in Ogden, maintains a strong online presence, offering 12 associate, bachelor’s, and certificate distance learning programs. Bachelor's degrees include health information management, radiological sciences, and professional sales. Programs utilize asynchronous learning through the Canvas platform. Some courses are taught through a self-paced format. Weber State offers its online programs in all 50 states. Out-of-state students pay the same low, per-credit tuition rate as Utah residents, which makes Weber one of the most affordable online colleges in Utah. There are no minimum GPA requirements to apply to Weber State, but applicants should still submit all of their prior transcripts. Of the 62,089 students enrolled in Title IV postsecondary institutions in Utah, nearly a quarter were enrolled in exclusively online degree programs (according to a 2012 NCES report), and approximately 75% of those students were living outside the state. With data from the same report, it's clear that such programs trend towards undergraduates; 81.6% of online learners were pursuing their first four-year degree. While some students worry about missed experiences from opting out of a traditional campus, the numbers above indicate they are not alone in their pursuit of a degree in a remote setting. As such, many colleges with online programs have created off-campus meetup locations and events to allow for the growing population of students to participate in classic university activities and peer-to-peer interaction. 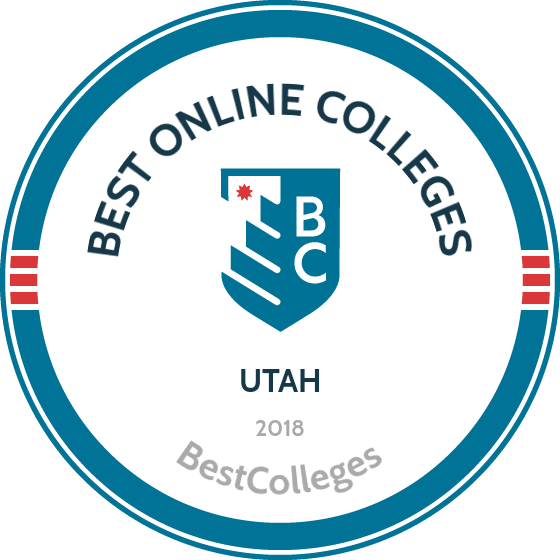 Browse our list of the best online colleges in Utah for more insight into distance learning programs in this state. A 20-year old initiative to boost technology in the classroom is now the well-established Utah Education Network, which coordinates online learning for both K-12 and higher education institutions. Such progress has been an essential part in reaching Utah's "Big Goal" to have 66% of the state's population complete a post-secondary degree by 2020. Because of these achievements, Utah is considered a leader in educational technology and has garnered praised by academic research for its successful use of online distance learning. Whether you choose a two-year, four-year or certificate program, Utah is a great place to pursue an online education. Employment growth in this profession is strong in Utah. According to the Utah Department of Workforce Services, long term projections show an increase of 48% in the total number of jobs between 2014 and 2024. Wages decreased by 5% from 2011-2016. In 2016, what were the top careers in Utah for people who had a degree in business administration and management? Data source: Utah Department of Workforce Services, Bureau of Labor Statistics. Data may not be available for every year. Employment growth in this profession is strong in Utah. According to the Utah Department of Workforce Services, long term projections show an increase of 59% in the total number of jobs between 2014 and 2024. Wages increased by 8% from 2011-2016. In 2016, what were the top careers in Utah for people who had a degree in accounting? Employment growth in this profession is strong in Utah. According to the Utah Department of Workforce Services, long term projections show an increase of 39% in the total number of jobs between 2014 and 2024. Wages increased by 4% from 2011-2016. In 2016, what were the top careers in Utah for people who had a degree in registered nursing? Employment growth in this profession is strong in Utah. According to the Utah Department of Workforce Services, long term projections show an increase of 42% in the total number of jobs between 2014 and 2024. Wages increased by 10% from 2011-2016. In 2016, what were the top careers in Utah for people who had a degree in health/health care administration/management? Employment growth in this profession is strong in Utah. According to the Utah Department of Workforce Services, long term projections show an increase of 152% in the total number of jobs between 2014 and 2024. Wages increased by 14% from 2011-2016. In 2016, what were the top careers in Utah for people who had a degree in criminal justice/law enforcement administration? Currently, no schools in Utah offer an online bachelor's degree program in criminal justice/law enforcement administration.